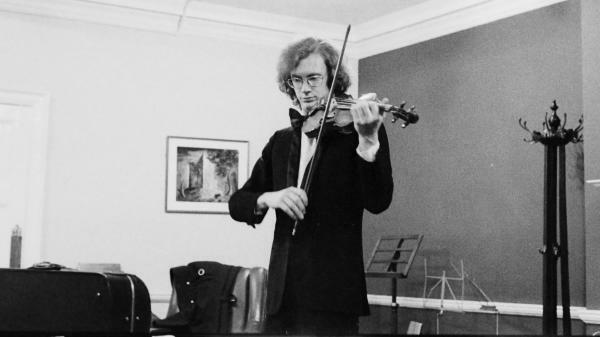 Geoffry Wharton with his mysterious Gagliano violin. Geoff plays his Gagliano violin violin in 1974. Audrey Call in the late 1920's. Geoff Wharton and Victor Marcelli, son of Audrey Call. Since the late 1960s, NPR's Ned Wharton's brother Geoffry Wharton has worked as a professional violinist in Europe. Wharton often played jazzy pieces by a rather obscure composer named Audrey Call as encores. Maybe to Europeans it was the exotic sound of jazz being played at classical concerts that won their hearts, but Call's "Witch of Harlem" became a hit within Wharton's performances. Wharton's discovery of Call's musical gems dates back almost 50 years, to when he was a student at Sacramento State in 1969. One day, as he was rehearsing in a practice room, Wharton discovered some unfamiliar sheet music sitting on a shelf. Wharton read them with a pianist friend, and the pieces soon after became a common fixture of his recitals as encores. So just how did this collection of jazzy tunes end up in Wharton's hands? "I'm not really sure how it got into the practice room. There might have been some magic involved," he says. The mysterious story of Audrey Call grew over the following decades, as Wharton tried to research the composer. He wrote to Call's publisher, Carl Fischer, in New York. The company responded, saying they knew of three of her pieces, which they published in 1937, but didn't have any biographical information. Wharton continued to look, and, with the introduction of Internet search engines, he finally got a hit. "I was just so excited. It was sort of an old record collector in London. And he had a little bit of biographical information — basically that she worked in the studio orchestras in New York, specifically for NBC, and worked on radio shows, mostly for one called Fibber McGee and Molly," Wharton says. Wharton eventually learned that Call, in her youth, won competitions for her violin playing, and went on to marry Italian-born composer and radio orchestra bandleader Ulderico Marcelli. Call studied at the Paris Conservatory, during a time when famous composers were running around Nadia Boulanger's circle, like Leonard Bernstein and Aaron Copland. "I mean, this is when [Maurice] Ravel is still alive. And Paris at that time was just such a hotbed," Wharton says. About the violin that Wharton plays: It dates from the middle of the 18th century, from the Italian violin master Januarius Gagliano. Wharton purchased the instrument in California in 1970, not long after he discovered the music of Audrey Call. And about 25 years later, Geoff made a startling discovery while going through certificates regarding the purchase of his instrument. "I nearly fell over because I looked closely at one of these papers, it said this violin belonged to Audrey Call Marcelli, dated 1945," Wharton says. "And that was the moment that I realized there was a kind of cosmic connection between the pieces I've been playing all these years and the owner of my Gagliano violin." Wharton wanted to learn more about Call and her legacy. He learned that she had died in 2001, at the age of 96, and tracked down her son, Victor Marcelli, who currently lives in the Bay Area. They met up this past summer. Marcelli says his mother probably sold the violin to raise money to travel. 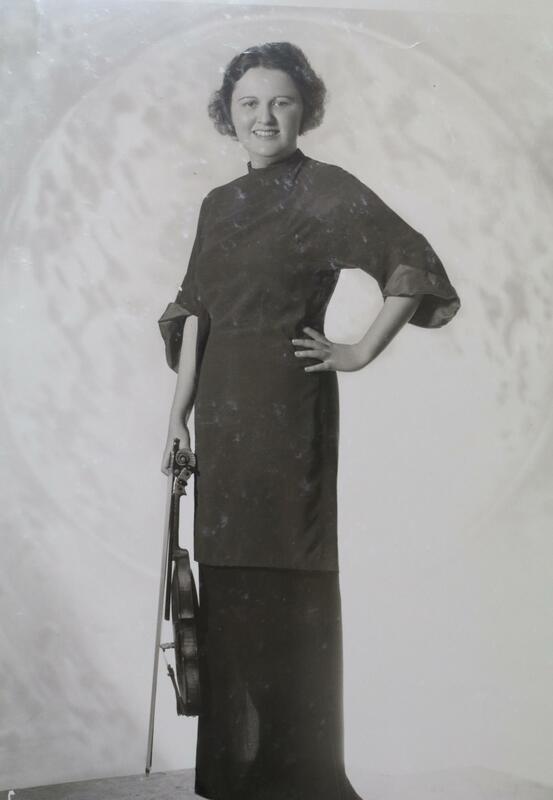 Later in life, she devoted her time to raising a family and teaching violin to hundreds of students. "Her whole life had to do with music, and she shared it with everybody," Marcelli says. "She shared it with the community, and she shared it with her students, and she shared it with the world because she was professionally active late into the 1950s." At the Marcelli home, Marcelli showed Wharton another violin she owned, and said she played it until just a few months before her death. "She just realized that she couldn't do it anymore," Marcelli says. "And I remember — very touching, it makes me want to cry — she put the violin in this very case, this very violin, and said, 'Goodbye old friend.' "
This violin isn't in quite the shape of Wharton's Gagliano, and could use a set of new strings, but Marcelli was happy to hear it come back to life. In a final twist of events, Marcelli gifted Wharton with his late mother's violin. "Let me tell you why — I believe in legacies," Marcelli told Wharton as he gifted him the instrument. "The value here is not that great, but the value to you might be more. In other words, just the fact that you could play a violin that she put away ... she would be thrilled. It's been sitting idle since 2001, never played until today. I am thrilled to do this." So, Wharton left the Marcelli home with another violin to carry forth the legacy of Audrey Call. 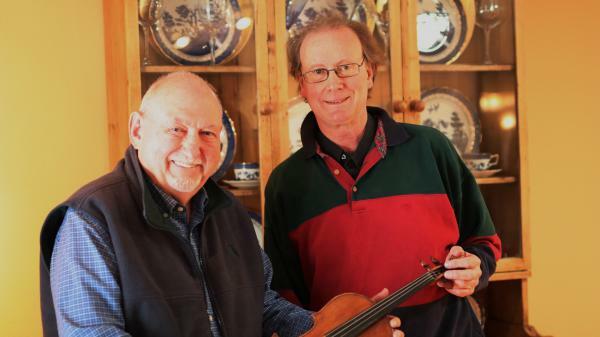 He says he won't sell the violin, but rather eventually pass it on — in the same spirit he received it from the Marcelli family. He hopes to work with a publisher to get her compositions back in print and available to more violinists. "They're not meant to be art works, but they're beautifully composed, seriously written," Wharton says. "Really gems." Halloween is near, so how about a spooky story about a violin? SIMON: This piece of music is from the 1930s. It's called "Hobgoblin" or "The Witch Of Harlem." It was written by a pretty unknown composer named Audrey Call. It's played here by Geoffry Wharton on an old Italian violin. And as we'll hear, the connection between Call and Wharton - total strangers and that violin - turns out to be an extraordinary story filled with serendipity. His brother NPR's Ned Wharton picks up the tale. 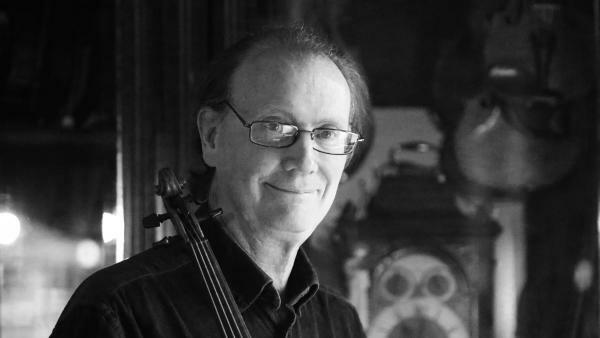 NED WHARTON, BYLINE: Geoff has worked as a professional violinist in Europe since the late 1960s. He often ended classical performances with these jazzy pieces by Audrey Call. Here he is in the early '80s playing "Hobgoblin" at a music festival in France. N. WHARTON: Maybe to Europeans it was the exotic sound of jazz played at classical concerts that won their hearts. But Audrey Call's "Witch Of Harlem" was a hit. GEOFFRY WHARTON: You know, they would literally scream, and I'd have to play it twice. N. WHARTON: Geoff's discovery of Call's musical jams dates back some 50 years. G. WHARTON: There might've been some magic involved. N. WHARTON: He was a student at Sacramento State in 1969. G. WHARTON: One day I was practicing in the practice room and there was some music, which I didn't recognize, just sitting on a shelf. And they were just great little pieces. That's when I started using them as encores in my recitals. N. WHARTON: So who was Audrey Call? Geoff spent decades trying to find out. G. WHARTON: I wrote to her publisher Carl Fischer in New York. They wrote back to me, no, we don't know anything about her. We know that she wrote three pieces because we published them in 1937. But we've got no biographical information on her whatsoever. N. WHARTON: He kept looking. And then Internet search engines came along. And finally, Geoff got a hit. G. WHARTON: And I was just so excited. And it was sort of an old record collector in London. And he had a little bit of biographical information, basically that she worked in the studio orchestras in New York specifically for NBC and worked on radio shows - mostly for one called "Fibber McGee and Molly." JIM JORDAN: (As Fibber McGee) Maybe little Audrey Call will play us something on that there fiddle of hers. What's the name of that piece, Audrey? JORDAN: (As Fibber McGee) Oh, "Hobgoblin." Is that one of them numbers you wrote yourself? CALL: Yes it is, Fibber. N. WHARTON: Geoff learned that Call was married to an Italian-born born composer and radio orchestra bandleader Ulderico Marcelli and that Audrey Call in her youth won competitions for her violin playing. G. WHARTON: You know, she studied at the Paris Conservatory. And that's in a time when there were all these famous composers running around, you know, the circle around Lili Boulanger - so Leonard Bernstein, Aaron Copland, 1920. I mean, we're talking this is when Ravel is still alive and Paris at that time was just such a hotbed. N. WHARTON: Now to Geoff's violin. G. WHARTON: Oh, this violin is so beautiful. It's got this glowing golden varnish. And, I mean, I've been looking at this violin every day for 50 years. And it's just as beautiful today as the day I bought it. N. WHARTON: It dates from the middle of the 18th century made by the Italian violin master Januarius Gagliano. Geoff purchased it in California in 1970 not long after he discovered the music of Audrey Call. But it was 25 years later - this is after Geoff had spent decades learning as much as he could about Call that he made a startling discovery. G. WHARTON: And I was going through papers that had been stored at my mother's house, certificates that had to do with my having bought the Gagliano violin. And I nearly fell over because I looked closely at one of these papers. It said this violin belonged to Audrey Call Marcelli dated 1945. G. WHARTON: And that was the moment that I realized there was a kind of cosmic connection between the pieces I've been playing all these years and the owner of my Gagliano violin. N. WHARTON: Crazy coincidence, right? Was it just because both lived in California that their fates crossed? We may never know. Audrey Call died in 2001 in, Santa Rosa, Calif., at the age of 96. Geoff eventually tracked down Audrey Call's son, Victor Marcelli, who currently lives in the Bay Area. N. WHARTON: They met up this past summer. Victor says his mother probably sold the violin to raise money to travel. Later in life, she devoted her time to raising a family and teaching violin to hundreds of students. MARCELLI: Her whole life had to do with music. And she shared it with everybody. She shared it with the community. And she shared it with her students. And she shared it with the world because she was professionally active late into the 1950s. N. WHARTON: At the Marcelli home, Victor showed Geoff another violin she owned and said she played it just a few months before her death. MARCELLI: She just realized that she couldn't do it anymore. And I remember very touching - it makes me want to cry - she put the violin in this very case, this very violin and said goodbye old friend. N. WHARTON: This violin isn't in quite the shape of Geoff's Gagliano and could use a new set of strings. But Victor was happy to hear it come back to life. G. WHARTON: Recognize that? Your mother's music played on her violin. MARCELLI: Yes, that's absolutely right. N. WHARTON: And here's the final turn to the story. Victor surprised Geoff with this. MARCELLI: What I would like to just tell you is that I want you to have this violin. MARCELLI: I think it would be meaningful to you more than anybody I can think of in the world. I believe in legacies. The value here is not that great, but the value to you might be more. Just the fact that you could play on a violin that she put away and said goodbye old friend, she would be thrilled. G. WHARTON: I really don't know what to say. Thank you so much. N. WHARTON: So Geoff left the Marcelli home with another violin to carry forth the legacy of Audrey Call. He says he won't sell the violin, eventually he'll pass it on in the same spirit he received it from the Marcelli family. And he hopes to work with a publisher to get her compositions back in print and available to more violinists. G. WHARTON: They're not meant to be art works, but they're beautifully composed, seriously written - really gems. N. WHARTON: That's Geoffry Wharton, violinist and champion of the music of Audrey Call Marcelli. For NPR News, I'm Ned Wharton. (SOUNDBITE OF MUSIC - Audrey Call’s “Canterbury Tales: The Bishop Checkmates) Transcript provided by NPR, Copyright NPR.